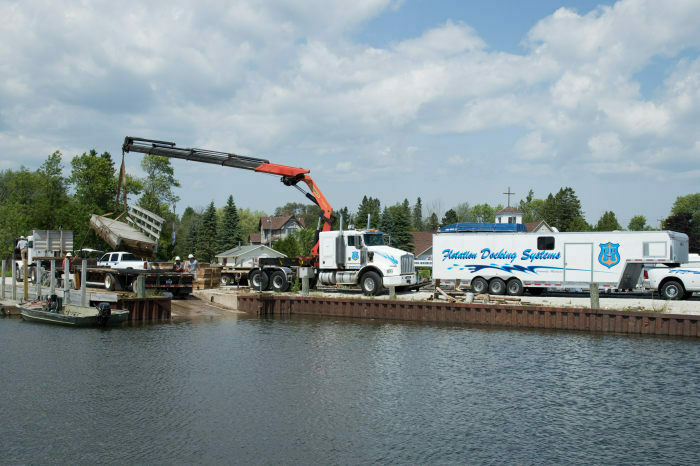 Cedarville Marine has a long history within the Les Cheneaux Islands, though not always as a marina operation. Originally opened as a Texaco gas station, the business evolved over time to include automotive repair services and boat engine maintenance. 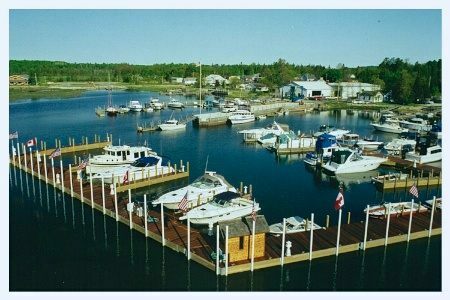 In 1984, it was purchased by the current owners who decided to shift their full focus to serving Les Cheneaux's recreational boating industry. The Texaco pumps were removed (along with all automotive repair service) and new floating docks installed. Since that time, Cedarville Marine has expanded its basin to nearly 80 slips with full utility service and is now a certified dealer and maintenance center for Arctic Cat and Mercury marine. We're strong believers in the old adage, "a picture is worth 1,000 words." 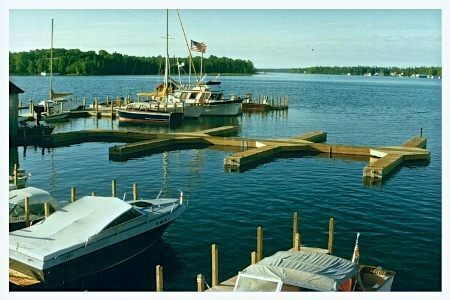 Accordingly, we've decided to use pictures of Cedarville Marine throughout the years to elaborate upon our story. 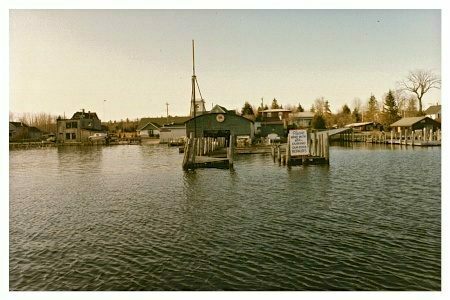 Although not a picture of the original docks, this mid '80s photo depicts the very beginning of current-day Cedarville Marine. The large building (center of photo) is the old boathouse. 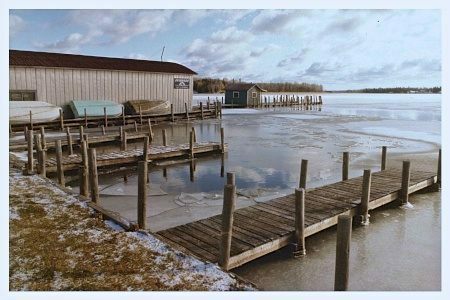 In the early days, Cedarville Marine had very few docks (all of which were in fairly rough shape), a boathouse, and shelter to greet boaters as they came to town. 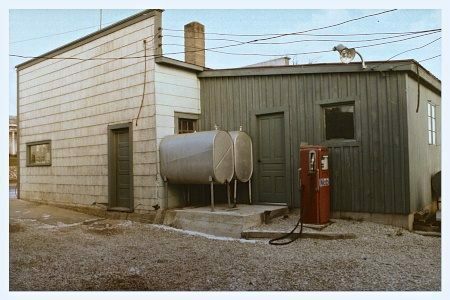 While slowly transitioning its focus from to boats in the early 1980s, Cedarville Marine (which was still named Cedarville Texaco at the time) served as a gas station downtown for cars. A number of noteworthy projects were undertaken during the late 1980s. 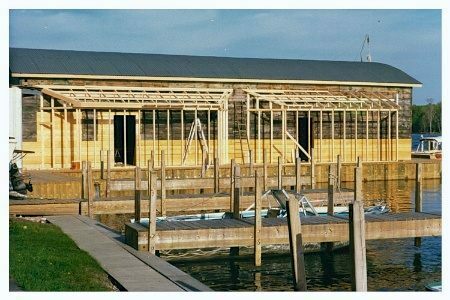 Rebuilding (and up-structuring) the existing boathouse was certainly one of Cedarville Marine's larger undertakings. The entire structure was supported on bunks while dredging out a new boat well. The building itself was actually expanded upon, thereby allowing for more storage space of engines and parts in close proximity to technician work stations. 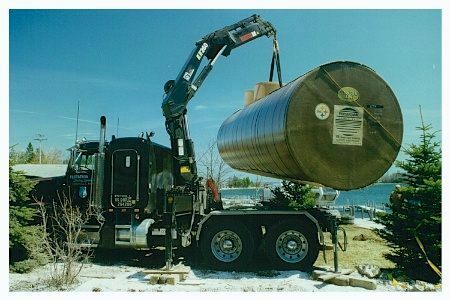 As Cedarville Marine expanded (and regulations changed), new in-ground fuel tanks were added in 1996 next to the boathouse with a little help from Flotation Docking Systems. 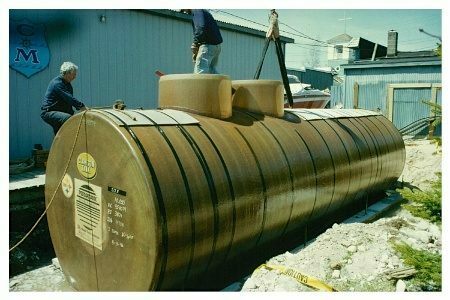 Once the tank's trench had been dug, a small crew began working to plumb the new fuel system (which would run out onto recently added floating docks). Once finished, the burial began. 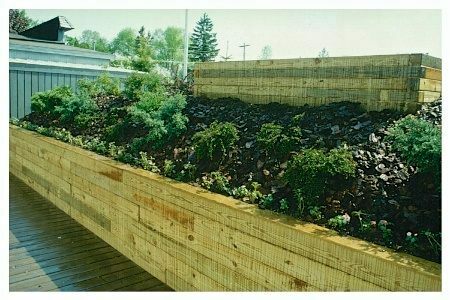 A structural wooden frame was built to surround the portion remaining above ground, and landscaping added to fully hide the tank. Once completed it was disguised as a simple garden to passers by. 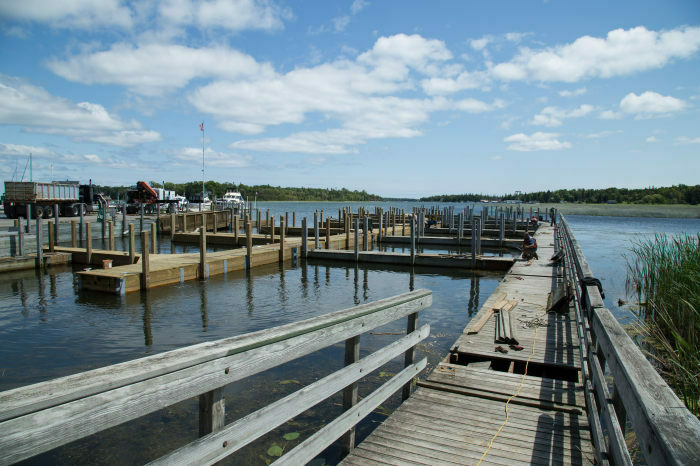 As the marina expansion continued, additional berthing space was added via new floating docks. The installation of these units presented a totally new and unique design from anything that had previously existed at Cedarville Marine. 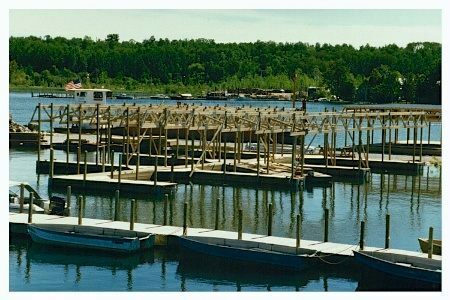 Once the new floating docks were installed, construction began on a covered shelter to offer additional protection from the elements to several marina clients. Cedarville Marine's covered slips were the first of their kind in Les Cheneaux. The shelter is still in great condition today, and remains the only available covered dockage at any marina in the area. 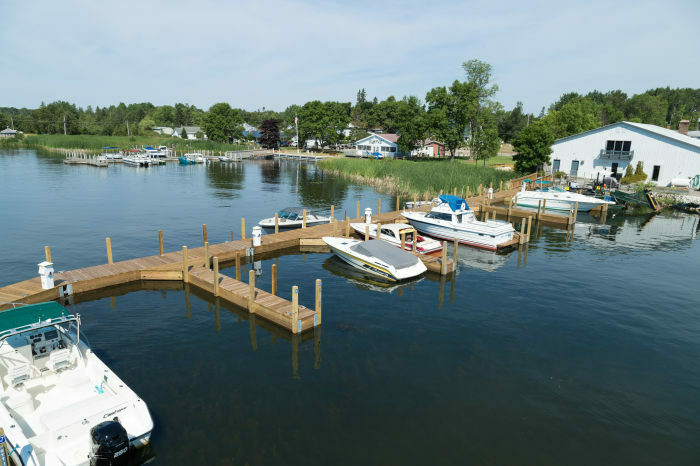 Following a substantial dredging effort that took place from fall 1999 to early spring 2000, Cedarville Marine undertook it's largest marina expansion thus far. This project significantly upgraded utilities and created a much more sheltered mooring basin. Completed in 2001, the expansion created more than 20 additional slips catering to larger vessels. Fueling and pump out services were also relocated, making them much more accessible to boaters. 2015 brought about a number of upgrades to our facilities, including a new aluminum gangway for the fuel pier, as well as replacement dockage for our launch ramp shelter. However, the most sizable of these "upgrades" was the installation of a new western pier (directly behind our marina office). 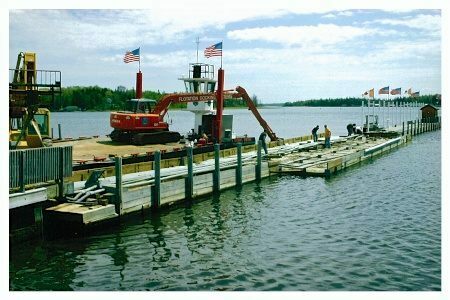 The new dock was offloaded into the water, section-by-section, and fully assembled before locating into proper position. 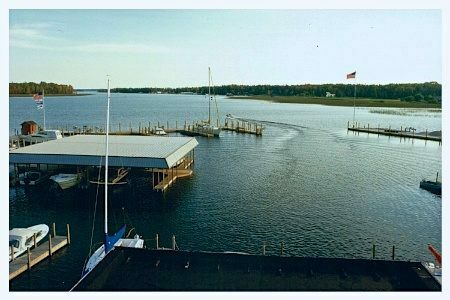 This approach allowed us to realize a much quicker installation, which minimized the pier's "down time." 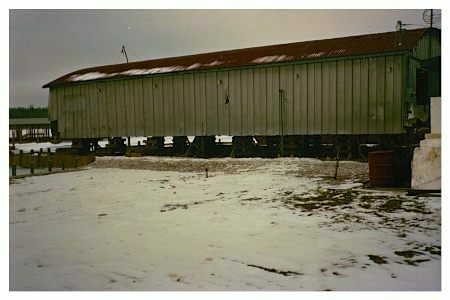 Following installation, this entire process was reversed - the old pier was disconnected, loaded onto trailers in sections, and hauled away. The newly renovated west pier is an exact match to its original footprint, however it offers a much more comfortable user experience. Utility pedestals were upgraded, and railing removed along the western side to accommodate additional tie-up space. Although this project did not generate additional slips, it was a much-needed improvement to maintain the high quality of service our clients have come to expect from Cedarville Marine.